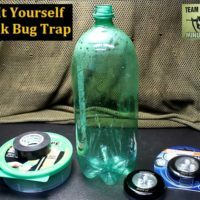 Sensible Prepper Presents: Cheap DIY Stink Bug Trap.Halyomorpha Halys (aka Stink Bugs) can be real pest and killing them cause a terrible odor. This is a Cheap and Easy way to trap them and get rid of them. Here are the items you'll need: Empty 2 Liter Plastic Soda Bottle Battery Power Press Button Light Electrical Tape Masking Tape Razor Thanks For Watching~ Sootch00 Music is from Jingle Punks Royalty Free Music through the Fullscreen Network. Used with permission.